Submitted by Terry: I have spent hours researching this piece, and I came across your website. Thank you in advance for any additional information on this Franklin D. Roosevelt toothpick holder. If you can help Terry please click on the comment button. Thank you! 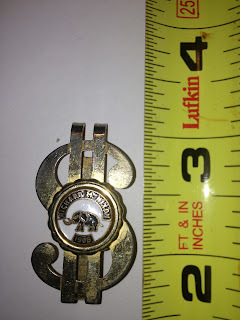 Submitted by Dana: This is an interesting vintage watch on chain with artistic design back featuring Ronald and Nancy Reagan. Dana is looking for information on this item and its potential value. If you can help Dana, please click on the comment button. Submitted by Dave: Hello-- I came across your site while I was trying to figure out the specifics of a cigar I have in my collection. 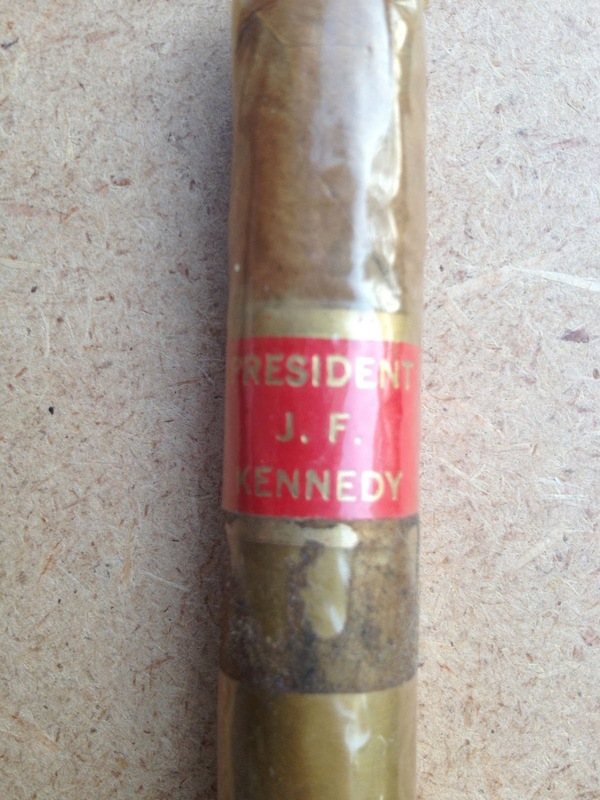 This was given to me by grandfather by an executive in the Secret Service (from the '50s to the '70s), and my grandmother gave it to me after my grandfather passed in 1990. 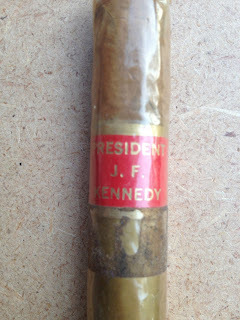 The Secret Service executive had several pieces of memorabilia in his collection, and he gave this piece to my grandfather (his good friend) several years ago. 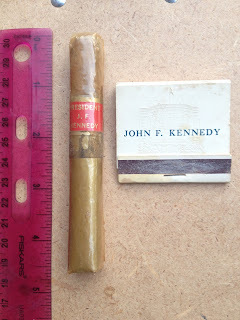 I also have an unused Eisenhower matchbook as well, but didn't include it in these pictures. From the information I've been able go gather online, this might be a post-embargo "official" JFK cigar (the cellophane means it's not a Cuban). Any insight would be appreciated. If you can help dave please click on the comment button. Submitted by Robert: I have been given a painting of Nixon and his cabinet as clowns. 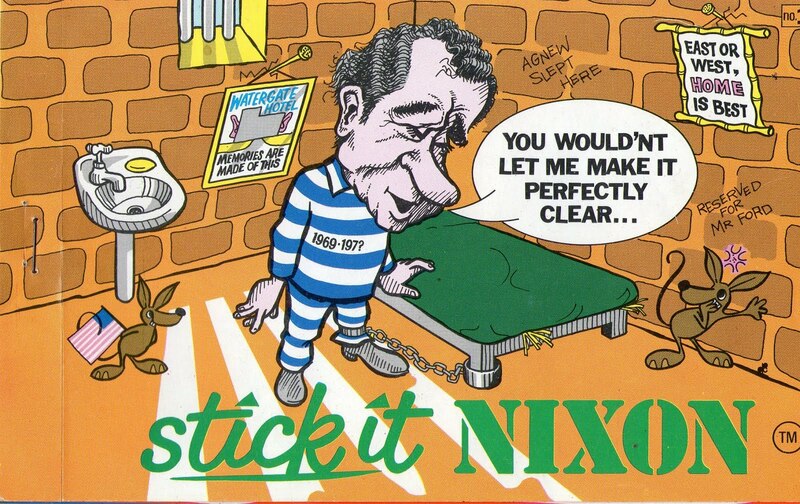 It appears the work was done during the Nixon Watergate era. A photo is available for reference. 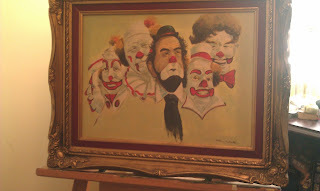 I would like some help in identifying the artist if it is at all possible If you can help Robert please click on the comments button. Thank you! Submitted by Francine: I have in front of me an old Iron Rest with "PRES. ADAMS" and "9-19" with some sort of a makers mark with an "m" at the end of it. Could this actually have belonged to president Adams? If you don't know where should I start to investigate ? Any help is much appreciated ! Can you help Francine? If you can, please click on the comment button. Submitted by Pat: I am attaching a photo of a Cleveland/Stevenson campaign ribbon I came across while cataloging some post-Civil War regimental reunions ribbons of my great-grandfather's. He served in the Tennessee 20th Regiment and Peter Turney was a colonel in the 1st Tennessee Regiment who was elected governor of TN. Looks like he ran on the same ribbon since his name was inked in:) If you can help Pat with additional information or value. Please click on the comment button. Thanks! Submitted by Steve: Anyone know who this candidate is? 1894 election. republican. Thanks! Submitted by Maureen: I have a Fostoria or Fenton Crystal ashtray from Sen. Goldwater’s final campaign for re-election to the Senate. 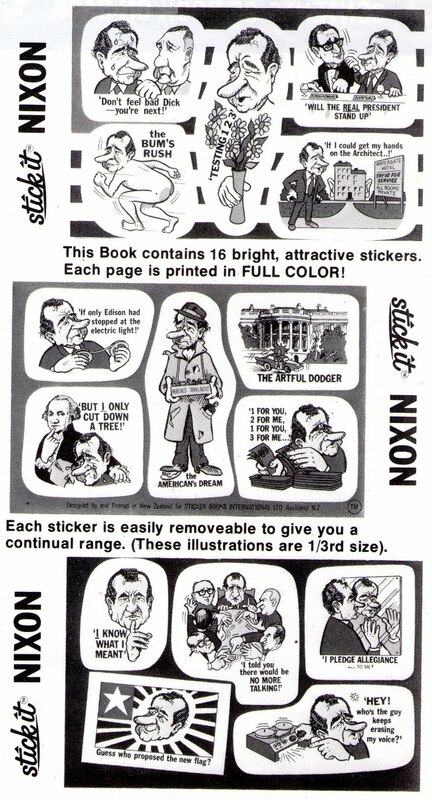 It is clear, with the Senate Seal at the bottom and his signature etched on the bottom as well. I was given this as a thank you gift for volunteer work on that campaign. Can you tell me what this may be worth? If you can help Maureen please click on the comment button.